The Katahdin is a well-muscled, medium sized, easy-care meat type sheep. They exhibit a natural tolerance of climatic extremes and are capable of high performance in areas that vary in geography, temperature, and humidity, as well as feed and forage. Katahdins usually have a docile and quiet disposition with good flocking tendencies – a temperament which contributes to easy handling. The coat can be any color from white to brown, black or spots thereof. Polled animals are preferred; scurried or horned (ewes only) are recorded as such. The purpose of the breed is to efficiently and economically produce meat. 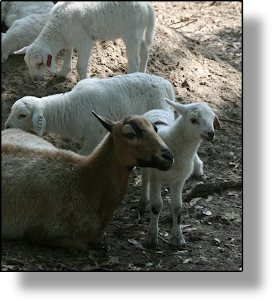 Katahdin ewes do not, as a rule, require much assistance at lambing, exhibiting strong maternal instincts with sufficient milk supply to raise twins or triplets. With good nutrition and management there is a high survival rate with the lamb crop. With the belly area being clean it is not necessary to pre-lamb shear. Katahdin ewes with such excellent maternal traits could be used in a cross breeding program to enhance survival rates with less stress at lambing time. The shedding coat of the Katahdin does not require shearing. They mature early and have strong fertility traits so early separation of intact rams is advisable. Small at birth, lambs grow and mature rapidly to an acceptable market weight using a good forage based management or with grain supplementation. Katahdin produces a lean carcass with a mild flavor. Some producers have experienced very little taste variation in the Katahdin meat even at a mature age, therefore maintaining a marketable product past the “lamb” stage.